Orientations, December 1986, p. 9. Although it has a better set of teeth and a more worried expression, the dragon here can be associated stylistically with others by Wang Bingrong (Sale 1, lot 112; Sale 2, lot 102); it may be that Wang influenced Li, but since the dates of neither are known with any accuracy, we can only guess. 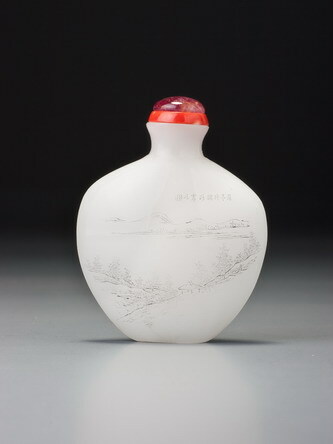 There is a tendency to see Wang as the instigator of the style, simply because he made far more exemplars of it than Li did, but all this really suggests is that Wang was the more successful artist commercially and better at attracting Imperial orders, if yellow glazes and five-clawed dragons are anything to go by. With its five-clawed dragon, we may assume that this, too, was made for the court, probably during the Daoguang reign. Features that obviously differ from the Wang Bingrong versions include the presence of twice as many dragons, a base band of formalized waves, and a very distinctive flaming pearl that seems to double as a bi disc. Li Yucheng was another of the potters of the broader group about whom the records are silent; he is known to us only through his wares. (although it has been suggested that a typographical error obscured one mention of Li that ranked him alongside Chen Guozhi and Wang Bingrong; see Miller and Hui 2006, p. 343). His works are considerably rarer than Wang Bingrong’s. Like the others, though, he produced a series of literati items other than snuff bottles. In the Baur Collection is a seal-ink box and cover with a floral design and a transparent glaze (Ayers 1974, vol. 4, plate A661), and in Fung Ping Shan Museum 1978there were three brush pots, one in pale yellow, one in pale green, and one, not illustrated, in apple-green (nos. 17–19). Several of his wares are illustrated in Miller and Hui 2006, indexed on p. 342. There is also a small group of snuff bottles recorded, one of which is in Miller and Hui 2006, no. 94, from the Denis Low Collection. On most of his wares he signed his full name, including the family name, whereas both those in the Bloch Collection are signed with the abbreviated form (see Sale 2, lot 29).